Following on from the previous post, asking where the anti-EU vote the media keeps talking about is, ComRes has published the findings of a poll of UKIP voters at the European Elections asking them to prioritise the issues that determined why they voted for the party. The details, published on Political Betting, show that leaving the EU trailing a long way behind controlling immigration in the priorities of those who voted UKIP. So even though this a ComRes poll, we are once again left to ask where this huge anti-EU vote – which the legacy parties and media are determined to use as an explanation for the UKIP vote and justification for the fantasy EU reform agenda – is. In years gone by UKIP members would have ranked leaving the EU as their number one issue by a very long way. But that is clearly no longer the case. Immigration has become the big issue, despite UKIP having no understanding of the global dimensions of immigration rules and no policy to address them, and it is that subject which has seen support for the party increase. The anti-EU cause is being diluted and eroded. This is leading to the other parties and media applying an outdated and inaccurate interpretation that they wish the metrics would underpin, rather than an interpretation of what the metrics actually show. The only surprise is that it took this long. The Daily Mail has decided to find out what goes on at foodbanks and how they are being used, following repeated, unchallenged shock horror stories from the BBC and Guardian about the dramatic increase in the use of free food handouts. The Trussell Trust – Chairman, Labour Party member Chris Mould – is the organisation that is behind the rapid growth in the number of foodbanks. The first question mark that raises doubts about the situations of many of the people using the foodbanks is that, irrespective of actual demand and for reasons known only to the Trust, has a goal of setting up 500 foodbanks around the country. Back to that shortly. From its origins in Bulgaria feeding homeless children sleeping rough, the story goes that while fundraising for the project a co-founder took a call in Salisbury, Wiltshire that from a mother who said, ‘my children are going to bed hungry tonight – what are YOU going to do about it?’. The co-founder began an investigation of ‘local indices of deprivation and “hidden hunger” in the UK’ and from there the creation of a foodbank network began to help people faced short term hunger as a result of a sudden crisis. The model that Trussell created meant that foodbanks would only give out food parcels to clients who come with a voucher given to them by accredited local welfare professionals – teachers, GPs or social workers. Recipients would be limited to three food parcels – each contains enough food to feed a family for a week – before the state must take over. The problem is that even without their actual circumstances being checked, anyone can approach a teacher or GP, plead poverty and claim they don’t have enough money for food and receive vouchers to present at the foodbank. It’s not a big deal for a teacher or GP to simply hand over a voucher. It allows them to move on from an awkward situation quickly. Suddenly, irrespective of need, a foodbank has a new client and the foodbank has ‘evidence’ that austerity is fuelling hunger. Yet while we can be sure some people do have genuine need, there is no scrutiny of whether the need is caused by genuine hardship or choosing to spend money on non essentials – and this leaves the system open to abuse and therefore the headline numbers nothing more than guesswork. One problem for those behind Trussell is a reluctance to recognise that their desire to show Christian charity can and does see human nature to take advantage of something available for free assert itself. If someone wants to give something away for nothing there will always be plenty of people willing to avail themselves of it, even when they don’t need it. So dramatically increasing the number of outlets where food can be obtained for free will obviously increase the number of people using the foodbanks – and unfortunately increases the opportunity for people who are not in need, and thus not entitled, to abuse the charity. This takes us back to the Mail story. It reveals, unsurprisingly, inadequate checks on who claims the vouchers, with one reporter obtaining three days’ worth of food simply by telling staff at a Citizen’s Advice Bureau – without any proof – that he was unemployed. Other people were given food parcels without even producing a voucher. What is worth noting is a story in the Guardian from 2012. It revealed that in 2011 Trussell’s Coventry food bank was overwhelmed after 23 local families, all from eastern Europe, who had had their benefits stopped, turned up without warning. The call went out to other network members, and more than 1,000kg of food was shipped in practically overnight from food banks in Gloucester and farther afield. Trussell see this as a success story for their charity. The fact however is that it is a failure of government policy – as migrants who are destitute and unable to support themselves are a burden and can, under EU law, be deported back to their own country. But as we know, the UK’s shambolic immigration policy has not been properly applied. Small wonder therefore that we hear asylum seekers are clients of the foodbanks, despite being given the means to feed themselves at taxpayers’ expense while their applications accumulate dust on shelves in Croydon. The Trussell Trust said it would investigate allegations of abuse, adding: ‘There is no evidence to suggest that awareness of the food banks is driving an increase in visitors, rather that food bank use is meeting a real and growing need.’ Of course, if users of foodbanks are not asked if they were aware of the foodbank before getting help, and the entities giving out vouchers don’t record if someone comes to them specifically asking for food vouchers rather than the entity identifying a requirement for food assistance as part of a wider need, then there won’t be any evidence. But it does not mean it isn’t happening. The inescapable problem is that no one knows whether the people asking for vouchers actually have disposable income but are now not using it for food because they can take advantage of the charity’s offering, or whether they prioritise their spending on other things such as drink, cigarettes, entertainment or non essentials for the same reason. Given some of the examples of abuse that the Mail has uncovered, and the BBC deliberately ignores and makes no effort to question, we can be certain a political agenda underpins the reporting of unvalidated foodbank data and self promoting press releases. It’s not just shabby, it’s downright dishonest. 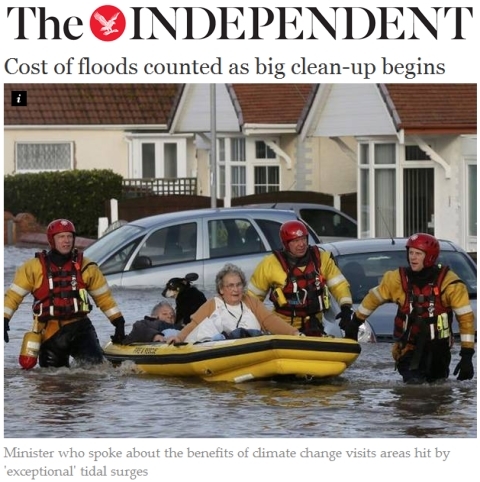 The Independent – a viewspaper not a newspaper – having taken it upon itself as part of the establishment to push the climate alarmist narrative relentlessly, is even ignoring what the Intergovernmental Panel on Climate Change has said about no evidence of a link between ‘climate change’ and ‘extreme weather’ and is trying to connect the east coast tidal surge to climate change. But in a snide piece of journalism it is doing it in an underhand way, designed to be subtle while being blindingly obvious, by making references to Owen Paterson’s comments about the potential benefits of climate change. Climate activists and their media mouthpieces keep suggesting extreme weather events are being caused by climate change. Yet that would mean the weather events they have latched on to would be happening only because of a tiny amount of temperature change that has been recorded. Paterson did himself no favours by describing the flooding this week as ‘quite exceptional’. They were comparable to the floods of 1953, lower in some areas and higher in others, which pre-date the warming cited as a cause of weather events that have occured many times over the centuries. But where there is an agenda being pushed by people who put their fingers in their ears to block out anything that undermines their belief system, and who refuse to provide balance in their reporting by publishing anything that contradicts it, we get what the media is serving up.